Calls allows you to connect with your users directly when they are browsing your website. Crisp lets you call anyone who&apos;s online and actively browsing your website. Your visitors receive calls directly in their chatbox. You can call them without time limit, as Crisp doesn&apos;t bill you based on how much time you spend in call. Open your Crisp dashboard and start a chat with an user, or resume an existing chat. Click on the Call with Crisp™ button in the user information sidebar (on the right) — if the button cannot be clicked, the visitor doesn&apos;t support calls, see below for more. Your user will receive a call request, directly in their browser, which they can accept or reject. 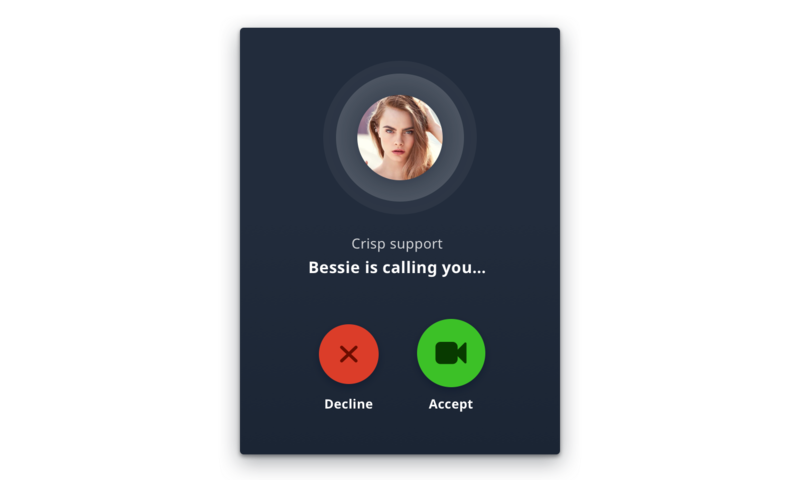 Once the user accepts, the call will be started and you will start receiving audio and video from each other. You can stop the call anytime, or disable / enable audio or video (ie. you need to mute your camera or microphone at some moment during the call). The visitor browser may not support calls (using WebRTC). Browsers such as Safari, as well as Internet Explorer do not support calls. Tell your visitor to use Chrome or Firefox instead. Your website is still using insecure HTTP. Browsers do not allow calls on HTTP websites. You need to upgrade your website to secure HTTPS to allow calls. The visitor you want to call must be online in order to be called. If the visitor is offline, the button will not show. Your browser must support calls (using WebRTC). Some browsers, such as Safari on macOS, do not support in-browser calls. Use our Desktop apps instead. Calls require your website to be subscribed to Unlimited. See our pricing page for more on this. If you are not subscribed to Unlimited, you will still see the Call with Crisp™ button, but you will be prompted to upgrade your plan subscription to Unlimited to enable the feature. Calls are encrypted end-to-end. Encryption is handled directly by your browser. In the event your browser needs to use Crisp servers to relay call streams (ie. your network is restrictive), Crisp still cannot read the call stream as it is encrypted before it enters our relay servers (only the recipient browser is able to decrypt the stream). Your website is not supporting HTTPS. 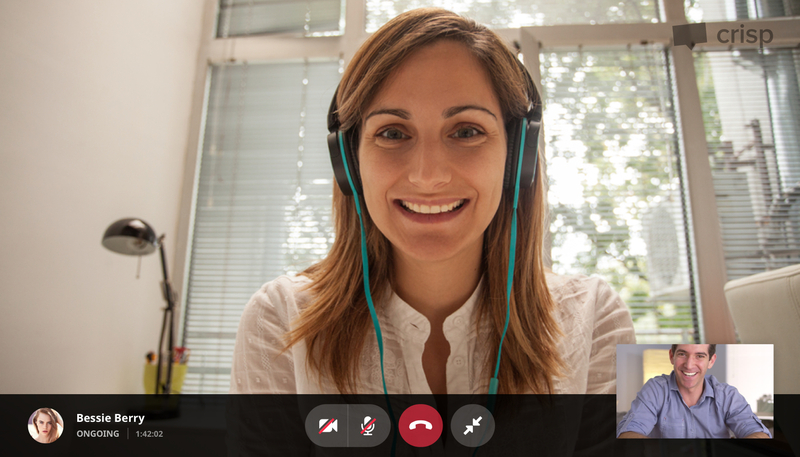 Crisp Video calls require TLS. Temporary network connectivity issues on our side or ours. Video or audio encoders / decoders (codecs) not supported between the caller browser and callee browser. Visitor or operator network bandwidth is too low. Call connections not allowed between users (should not happen, as Crisp provides a relay server as a fallback, if browser-to-browser call connections cannot be established). If you encounter an issue with calls, please get in touch with our support. We&apos;ll work on spotting and fixing the issue.